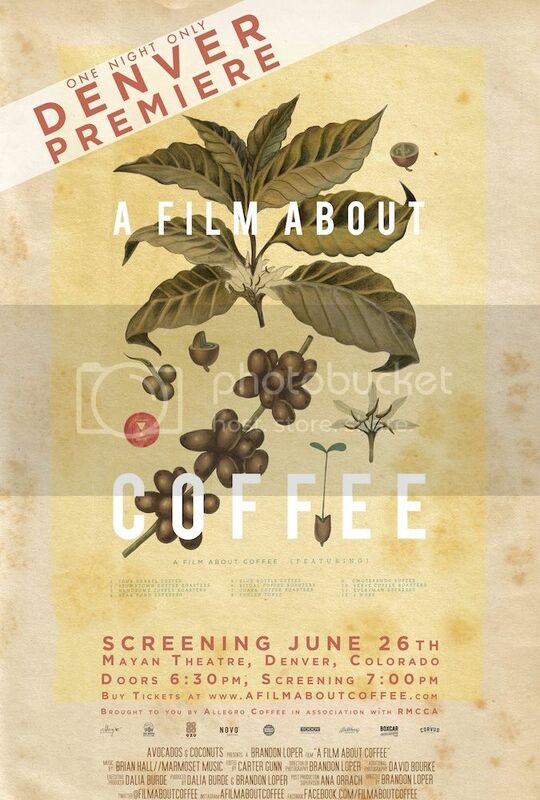 "A Film About Coffee" is coming to Denver thanks to the generous support of Allegro Coffee, Rocky Mountain Craft Coffee Association and many of your favourite local roasters. Join us at the Mayan Theatre and while watching, enjoy coffee from Allegro Coffee, Huckleberry, Novo, BoxCar and more. Immediately following the film, a Q + A will be held with director, Brandon Loper, and local coffee people including Darrin Daniel who is featured in the film. Purchase tickets in advance. Be sure to bring your paper printout or barcode on your mobile device. Doors open at 6:30pm. Please arrive promptly 6:30pm to enjoy free coffee and find your seat before the show! Also, please join us at 46 S Broadway, Denver, CO after the Q + A for an after party hosted by Steadbrook/Middle State Coffee, Allegro, and the RMCCA.